Thwaites 300 kg micro pedestrian controlled dumper powered by Honda GXV 160 4.3 BHP four stroke air cooled petrol engine, 700 mm wide, belt driven manual shift transaxle transmission with four forward speeds and one reverse. Selectable two and four wheel drive for traction or maximum manoeuvrability. 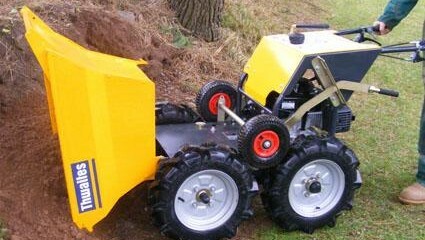 Ideal for all applications including construction, landscaping, site maintenance and agriculture.